Heather, of Shadowcatcher Imagery, talked about the benefits of hiring a professional wedding photographer. Heather shared her experience with us and gave us a couple of tips on how to have unique wedding photos. Welcome, Heather! Please introduce yourself and Shadowcatcher Imagery to our readers. Thank you so much for this opportunity to introduce myself and my wedding photos company. I am Heather, co-founder and She-E-O of Shadowcatcher Imagery. Shadowcatcher Imagery is a team of talented, creative wedding photographers and videographers serving the San Diego and North County areas. Shadowcatcher Imagery was established on July 4th, 2004, Independence Day, by myself and my husband Skip. Over the years, Skip, also a super talented photographer, and I have grown our business to include an amazing trusted team of creatives, bringing our couples Wedding & Engagement Photography-Videography and our signature Photo Booth-The Ultimate VIP Selfie! How did you start doing wedding photos? I became a photographer out of that need to successfully have a creative outlet. You know that urge you have to be a singer and you roll up all the car windows and sing at the top of your lungs? That was the feeling I had deep inside me to artistically create and produce the creative ideas my mind was always filled with. I tried painting, sculpture, all mediums, but somehow those visions and the way to execute them wouldn’t transfer from my brain to my fingertips until I first picked up a camera. The camera let me translate all of those ideas, come to life, and in a form, I wasn’t embarrassed to share! The moments at a wedding are one of a kind amazing, and it is always a thrill and an honor to be there to capture the must have wedding photos. After a successful run in the San Diego art scene, which included two solo shows of my photography at the San Diego Art Institute, and a showing at The Super Bowl, Skip and I both felt it was time for something with more meaning. What better than a wedding day to be surrounded by all those powerful emotions that fuel my creativity? The bride when she first slips on her dress, his face as she steps down the aisle, Mom's tears quietly falling down her cheek during the ceremony. The moments at a wedding are one of a kind amazing, and it is always a thrill and an honor to be there to capture the must have wedding photos. How would you describe your wedding photos? There really isn’t one word to describe our wedding photos, I feel it is a beautiful blending of Fashion/ Editorial, Candid and Artistic. It’s all about seeing and feeling those special moments, and at times being able to create those moments for the camera. Tips for couples who are interviewing a wedding photographer? When interviewing wedding photographers, it’s so important to feel comfortable with your photographer. Is this someone you would feel good about having by your side from beginning to end on your wedding day? Do they make you feel relaxed and happy, is their appearance neat? How comfortable and self-assured is the photographer? This person will be guiding you, your bridal party and your whole family through posing and various formal posed portraits throughout the day. Can this photographer work with everyone in a fun, relaxed confident manner, and do they have the experience to adapt on the fly should someone run late? What questions should they be asking when selecting a photographer? If I were selecting a photographer for wedding photos, the first questions I would ask would be about equipment. Does the photographer have multiple cameras, flashes, lenses, batteries, memory cards, etc.? After doing this for 15 years, as well as we prepare beforehand, we know something can go wrong with gear during an event... it happens. With multiple cameras and backup gear, we barely miss a beat if something malfunctions. I would also ask about how the photographer backs up the wedding photos, do they use off-site storage? And last, make sure you are clear on what exactly the photographer will deliver in the end. 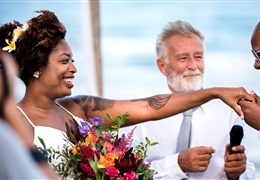 Do you get all of the wedding photo gallery, or maybe just 200 that the photographer selects, and then you are faced with more of an investment if you want the remainder of the wedding photos! Some of the questions we are most asked about during our consultations are about back up equipment and our experience at their venue. We are always happy to talk about our back up equipment. We have at least 2 back up cameras, lenses, etc. each and they are always right by our sides so we can change things up in a heartbeat if we need to. "While your lead photographer is covering the dance, our second photographer or assistant is getting that priceless shot of Mom wiping a tear from her eye"
Do you recommend a second photographer at the wedding? YES! Always! We are often 3 photographers. Two main photographers and then an assistant who is also a photographer who captures the reactions of family and friends while we cover the couple. For example, during the first dance. While your lead photographer is covering the dance, our second photographer or assistant is getting that priceless shot of Mom wiping a tear from her eye. 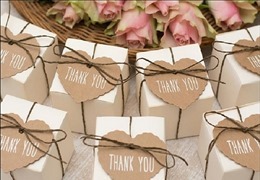 A wedding day is packed full of events that happen quickly and emotions and moments that are happening everywhere. We want to be sure we have cameras available to capture every smile, teardrop, and embrace. After all, when you look back at your wedding photos, just that one photo can bring back all those feels. How does a typical wedding photoshoot go? First, I believe there is no typical wedding photoshoot. Each one is as complex and unique as the couple. My best advice is to listen to your photographer on the timing of the day and trust their experience to know how long they need to capture the various wedding photos throughout the day. You wouldn’t tell the baker how long to take baking the cake, or the florist how long to take designing your arrangements, it is the same with your photography. You are investing a large amount of money, and this investment will be what you have to look back on years to come. 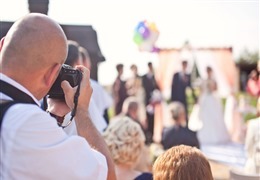 Your photographer knows how long they need to creatively capture the events. Work with them to arrange to get the time they need to bring you the wedding pictures ideas of your dreams. Any tips for locations, backgrounds, and places that would result in best wedding photos? The best locations sometimes are often the least expected! We love it when our clients think outside the box. We did an engagement session once inside a Home Depot because our couple was very into home improvement projects! A good photographer can make magic happen just about anywhere. We always love that light an hour or so before the sun sets, this is always ideal. Lightly shaded areas are always preferred to direct sunlight. And if it rains on your wedding day, don’t despair, rainy day wedding photos can be gorgeous given the right lighting and a bit of creativity! 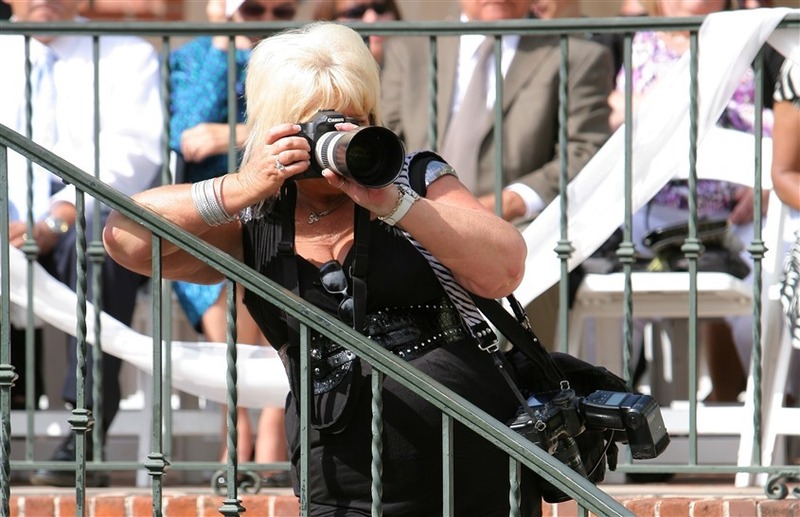 For those on a tight budget, which photography services are a must have vs. nice to have? We offer Photography, Video, and Photo Booth services. I always say the photography is the key place to invest when budgets are a little tighter. In today's digital age, there is still no substitute for that feeling as you sit together and hold your wedding album in your hands and turn those pages reliving every special moment. This album will be shared with your children, your grandchildren. In the end, the unique wedding photos and the memories are all that’s left when the day is done. Splurge on your wedding photos. What should couples prepare and arrange ahead of time for their photographer to be the most effective? We always send our couples some forms to fill in that let us know the different formal groupings they would like captured the day of. 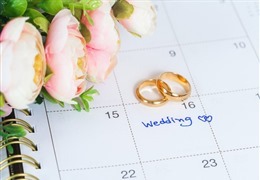 We take this information and put it into a timeline for them, so they can let everyone know where and when they need to be available for wedding photos. I am a strong believer of going into the wedding day with a set plan, so that we can spend our time with them working creatively and keeping our couples relaxed rather than worrying about who we need for wedding photos. Our couples should be prepared to relax and let go. 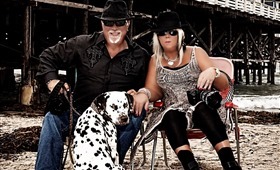 We love it when our couples trust in our vision and experience to guide them through the process. 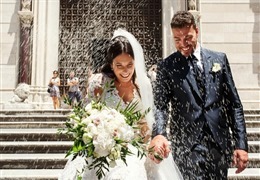 By the wedding day, we have taken the time to get to know our couples, and their styles so that we can implement that into their wedding photos bringing them photos that are truly unique to their style. Learn more about Shadowcatcher Imagery and see what they have to offer!